Nut facts, an information sheet for kids cooking activities. Nut facts and general information about nuts. Traditionally nuts were only available in autumn time. (Just think of the squirrels gathering nuts in autumn time and storing up for the winter) Now they are available year round. Peanuts grow on a plant that flowers on top but the peanuts actually grow under ground. 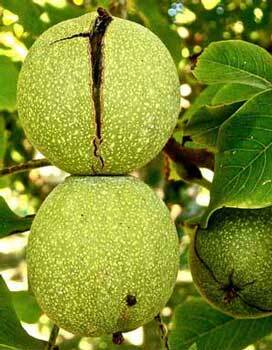 Walnuts, pecans, chestnuts, almonds and other nuts all grow on trees just like the pictures below. You can buy nuts already packaged throughout the year. 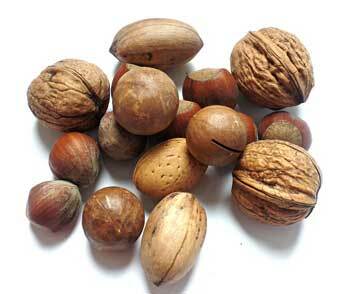 If you are buying nuts in their shells look for shells with no cracks or holes. They should have no rattling noise if shaken. 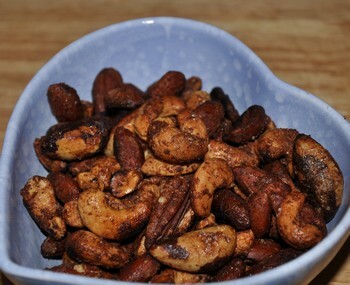 Store nuts in a cool, dry place or in the freezer for longer storage. Nuts are used as toppings. They are great in breads, toppings, cakes, casserole dishes and they are a great snack. They are available to us year round thanks to the conveniences of today but autumn time is their true peak season. 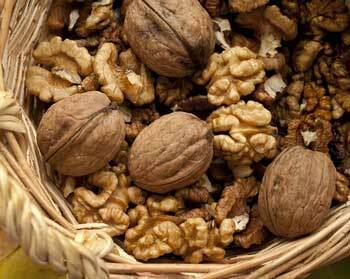 Nuts are high in protein and fiber. Combine cornflakes, pecans, and parsley together in bowl. Pour milk into flat bowl or pie plate. Dip chicken in milk and then coat in crumb mixture. Place in baking pan and bake at 400 degrees for 15 minutes until crispy and no longer pink in the middle. Beat egg white in small bowl. Toss egg whites with nuts to coat. Add sugar, cinnamon, nutmeg and cloves to the bowl. Toss to coat. Arrange nuts in cookie sheet, laying flat, and toast at 300 degrees for 30 minutes.